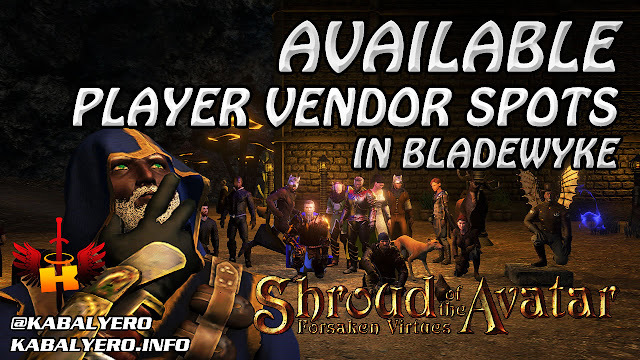 Vendor Spots Available In Bladewyke, A Town Next To Etceter 🏠 Shroud Of The Avatar (Town Check) - KABALYERO - PLAY, BLOG & EARN! Bladewyke is a Player Owned Town governed by Brass Knuckles and it's right next to Etceter, an NPC Town with high traffic. With Etceter's high traffic, this makes Bladewyke a great location both as a place of residence and for business like selling things to other Avatars. Yesterday, I was in Bladewyke checking out some of the available and potential Player Vendor spots in town. These Player Vendor spots are all located very near the entrance of Bladewyke. To see these available Player Spots, watch the video below.